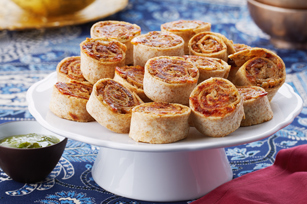 Philadelphia Cream Cheese and Cracker Barrel Shredded Tex Mex Cheese adds a delicious cheesy creaminess to these pinwheels. Combine all ingredients except tortillas. Spread 1/2 cup chicken mixture onto each tortilla; roll up. Cut each roll-up into 10 slices. Place, cut-sides up, on parchment-covered baking sheets; spray lightly with cooking spray. Bake 25 min. or until pinwheels are crisp and chicken filling is done. Serve with additional green chutney for dipping. Prepare using sun-dried tomato-flavoured tortillas or spinach-flavoured tortillas.